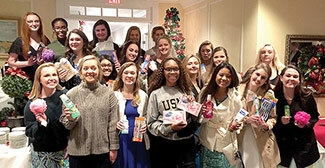 During the recent Holly Ball season, debutantes helped then reigning Queen Trinity Bea collect items for Girls Empowerment Camp. 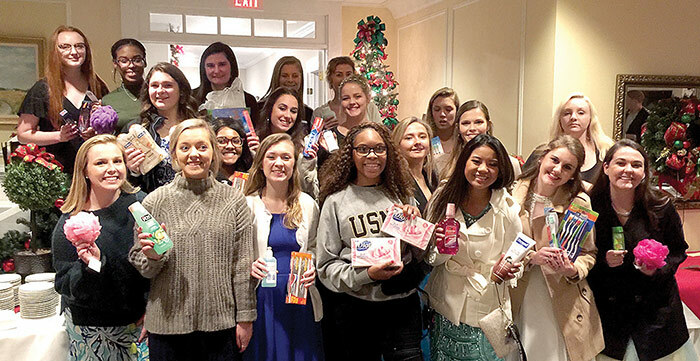 The Holly Ball Committee and the Tidewater Foundation are pleased to continue the tradition for community service opportunities for the debutantes. The Holly Ball is the main fundraiser for the Tidewater Foundation and 100% of the proceeds from the ball are presented each year to groups from the Northern Neck, Middle Peninsula and beyond, reported Lara Kelley. 2018 Holly Ball Queen Trinity Bea chose Girls Empowerment Camp (GEC) as her community service project. GEC is a program that hosts some 40 girls ages 12-18. It helps bring exposure to teenagers so that they may travel, tour colleges and practice public speaking, said Kelley. GEC also creates opportunities for participants to tour the White House, see the ocean for the first time and enjoy Broadway shows. Through donations GEC endeavors to provide each girl with adequate supplies while they are at camp, she said….